We have a wonderful old (1952 vintage) three-point, Massey Ferguson tractor that needs some maintenance and refurbishing. Finding a mechanic that will work on it is the first priority! Pasture shelters - We would like to construct several three-sided shelters, in the fields, for bad weather. Work Day participants to help repair fences, work on organizing barn, etc. There are a number of ways for you to donate to Horses Forever and we deeply appreciate any contribution you are willing to make. 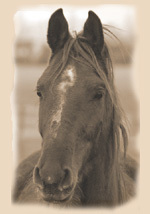 Your dollars go directly to the acquisition and care of horses in need. Moneies donated go directly to cover grain, hay, veterinarians, equipment fuel, hoof trimmings, trainers, office supplies, utilities, and insurance. We accept payments by check and through PayPal (you can use your credit card through this on-line service). You may choose to make a one-time donation or make an on-going contribution through our "Sponsor-a-Horse" program. To send a donation via check, please click here for a donation form. Print and mail it with your check. Donate using Paypal, or go to Paypal.com and send your donation to admin@horsesforever.org. You can also help Horses Forever by shopping through iGive or AmazonSmile. This is our opportunity to recognize all those that have helped Horses Forever, over the past year, either monetarily or “in kind”. Colorado American Saddlebred Horse Assoc.